There might be more than one way to skin a cat, but when it comes to grilling the perfect brisket, there's one brand that more and more competition pitmasters worldwide are choosing to use as their prize-winning secret weapon. 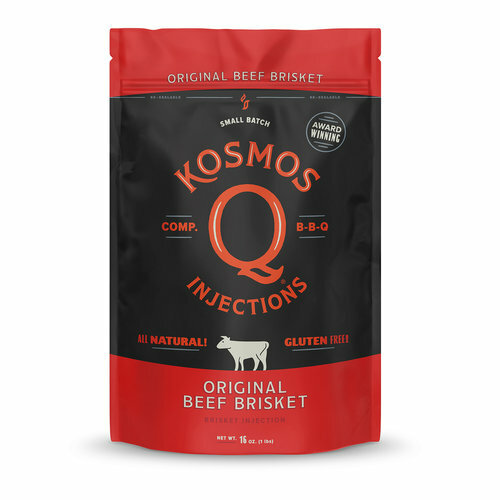 Using a proprietary blend of salts and gums to retain moisture, while enhancing the brisket with natural beef flavor like no other injection you've ever experienced, Kosmo's Q has revolutionized the way grillers throw meat. With an unmatched savory complexion, there's no beating a Kosmo's Q beef brisket injection. We took the liberty to go ahead and make the best beef injection amazing for shoulder clods, roast beef, wagyu briskets, or competition briskets and more. Our special blends set us apart from the competition by a long shot. Beef marinades will come and go but with Kosmo's Q we are a staple! MIXING INSTRUCTIONS: Mix 1/3 cup of product to 2 cups liquid (beef broth, distilled water, or whatever liquid you prefer) adjust to personal taste as needed. (Enough for 14 lbs. beef). INGREDIENT STATEMENT: Hydrolyzed Soy Protein (Contains Salt), Sodium Phosphate (35%), Autolyzed Yeast, Disodium Inosinate & Disodium Guanylate, Xanthan Gum. Contains: Soy.